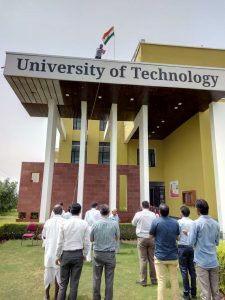 On 15 August 2018, University of Technology, celebrated Independence day with zeal and spirit befitting the occasion as a ritual that’s carried on every year. The Indian tricolor was unfurled in the field in the morning. Thereafter, the cultural program began with the lighting of the lamp carried on with a welcome speech. The university choir set the pitch for the program with prayer songs. The poems described the valour of Rani Laxmi Bai and paid homage to the efforts of the numerous freedom fighters of India. The choir enthralled the audience with the patriotic songs they sang. The highlight of the program was the enactment of the Indian freedom struggle by the students. It urged today’s generation to value the freedom we have secured after the sacrifices of many. Post this cultural extravaganza, students participated in games that were organized. The prizes they won added cheer to the day.